The Passionate Post-Punk Of Bloc Party Hear and download a full concert from one of England's most exciting new bands. 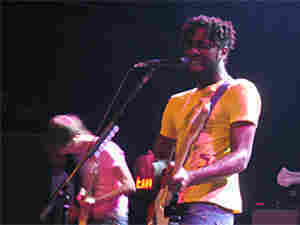 Bloc Party's full performance at Washington, DC's 9:30 Club was originally webcast live on NPR.org on June 16. It's the latest in a series of live concerts from NPR's All Songs Considered. Bloc Party's passionate, often manic, post-punk sound draws as much inspiration from Joy Division and The Smiths as from Dizzie Rascal and DJ Shadow, making them one of the most exciting new bands to come out of England in recent years. Bloc Party's debut CD Silent Alarm is earning wide critical praise, with some saying it's only a matter of time before the band "takes the U.S. by storm." The group was officially formed in the fall of 2003 with guitarist Kele Okereke fronting the band on vocals, Gordon Moakes on bass, Russell Lissack on guitar and Matt Tong on drums.